In one recent year alone, AMVETS national service officers processed more than 24,000 claims that resulted in veterans receiving some $400 million in compensation. This commitment to service traces its roots back to 1948, when our NSOs first began helping veterans of World War II to obtain the benefits promised them by the federal government. AMVETS National Service Officer Robert Estes provides encouragement to a veteran undergoing physical therapy at the VA medical center in Dallas, Tex. Coincidentally, it was these returning veterans who provided the impetus for forming AMVETS in the first place. At the time, many of them belonged to veterans clubs on college campuses. As the number of returnees swelled into the millions, it was evident that some sort of nationally organized assistance for them would be needed. The older established national groups wouldn’t do; the leaders of this new generation of veterans wanted their own organization. With that in mind, eighteen of them, representing nine veterans clubs, met in Kansas City, Mo., and founded The American Veterans of World War II on Dec. 10, 1944. Less than three years later, on July 23, 1947, President Harry S. Truman signed Public Law 216, making AMVETS the first World War II organization to be chartered by Congress. 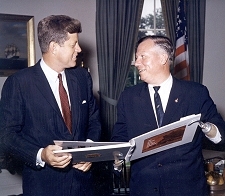 President John F. Kennedy (left), a former AMVETS post commander, meets with AMVETS National Commander Harold S. Russell, winner of two Academy Awards. In 1961, Kennedy signed legislation enabling the USS Arizona Memorial to be completed. 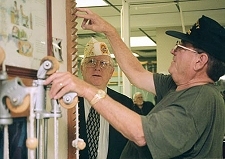 Over the years, AMVETS has been in the forefront of public-policy related to national defense, services for homeless veterans, adequate funding for the Department of Veterans Affairs, concurrent receipt of retirement pay and disability compensation by disabled military retirees, veterans employment and training, POW/MIA accountability and flag protection. 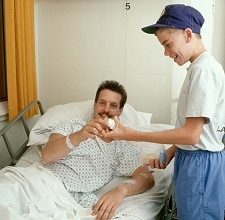 A member of the Junior AMVETS presents a personal-care kit to a veteran hospitalized at the VA medical center in Louisville, Ky. On “Because We Care Day,” AMVETS volunteers may distribute as many as 30,000 of the kits, which are donated by the AMVETS National Service Foundation. In addition to the work of our national service officers, other AMVETS members, as well as those in the AMVETS Ladies Auxiliary, will devote as many as 250,000 hours of free time a year to brighten the lives of hospitalized veterans. Here, something as simple as playing cards with the lonely or watching television with the disabled can make a world of difference. So can the assistance we give those who want to finish their education. Each year AMVETS awards scholarships totaling $40,000 to deserving high school seniors, ROTC students and veterans pursuing higher education. But helping others is not limited to our fellow veterans. AMVETS members in more than 1,400 posts nationwide also promote and support “quality of life” community-service programs ranging from Special Olympics and ROTC to scouting and organ-donor projects. Apart from these initiatives, the organization has thrown its monetary support behind work on such national monuments as the USS. Arizona, the Statue of Liberty and the Vietnam Veterans Memorial. It also sponsors its own carillon program to honor America’s deceased servicemen and women. Since 1949, when President Truman dedicated the first carillon at Arlington National Cemetery, this program has grown to encompass more than 60 sites in the United States and overseas. 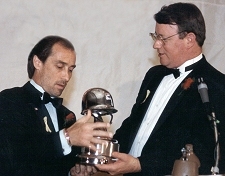 Entertainer Lee Greenwood (left) receives the AMVETS’ Silver Helmet Americanism Award from National Commander James B. King. Greenwood was honored in 1988 for his popular patriotic anthem, God Bless the USA. Another tribute unique to AMVETS is the Silver Helmet Award, often referred to as the Veterans Oscar. A replica of the World War II GI helmet, this prestigious award is presented annually to recognize excellence and achievement in Americanism, defense, rehabilitation, congressional service and other fields.